Just a minor abnormality but: If you successively add new goals with shift+ctrl+g the second added goals gets an empty default title. Just hit shift+ctrl+g twice. When you Add a Subgoal or Neighbor, the new goal appears with the default name 'New Goal' selected in the name field in the panel header, so you can type (or paste) text to name it. This should indeed work exactly the same on multiple use of the hotkey shortcuts (even if you do not enter text or do anything else in between each use of the shortcut). We cannot reproduce the error you have reported here in our tests (see the attached screenshot) and we have not heard from anyone else experiencing it. If the issue is in the standalone application Goalscape Desktop, please try the 'uninstall and reinstall Goalscape Desktop and Adobe AIR' fix: step-by-step instructions are on our Known Issues page. If it is in the web application Goalscape Online, please ensure that you have the latest Adobe Flash Player installed and enabled in your browser. We also recommend Mozilla Firefox or Google Chrome – and Chrome uses its own Flash plugin so it is always up to date. Installed version of Adobe Flash Player (you can see this if you mouseover the 'Goalscape' logo at top left of the Online screen). How you connect to the internet (direct Ethernet/WiFi or via a LAN). A screenshot showing how the Goalscape workspace appears for you after multiple use of Ctrl+ Shift+ G would be very helpful. Thanks very much for the additional details. 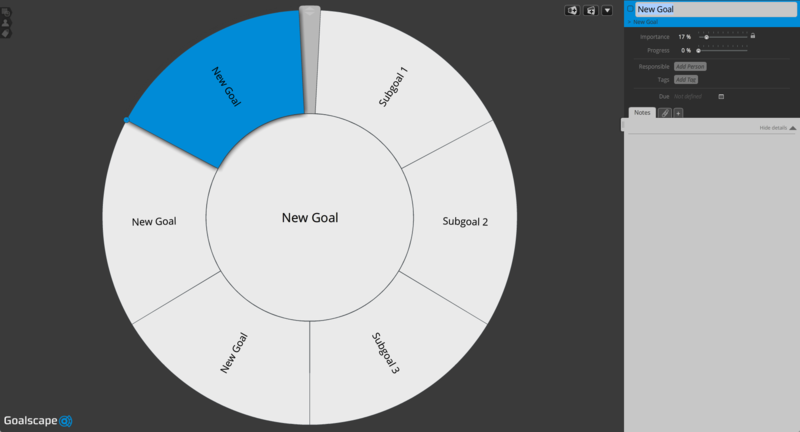 In Goalscape Desktop under Windows 10, on multiple successive use of Ctrl+ Shift+ G to Add Neighbors, the second one added appears with no default 'New Goal' name text – although it appears that the third one added (and any subsequent ones) do have the expected default name. If the above is not an accurate description of the error you have encountered please post again to clarify. You appear to have the latest Adobe AIR; nevertheless you may wish to try the 'uninstall and reinstall Goalscape Desktop and Adobe AIR' fix (step-by-step instructions for which are on our Known Issues page. Please let us know if this works for you.